← Beef Tostadas. TKOA Parody WOTE. Well, this video was unexpected. Continue rocking out to some exceptionally good chicken. 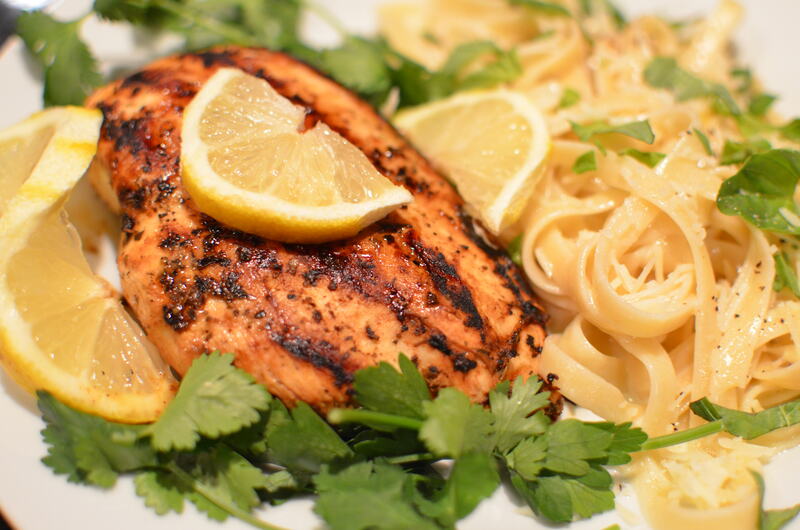 The herby lemon marinade gives the grilled chicken mouthwatering flavor. The (very, extremely, swimmingly) creamy fettuccine alfredo makes a divine side dish. 1. 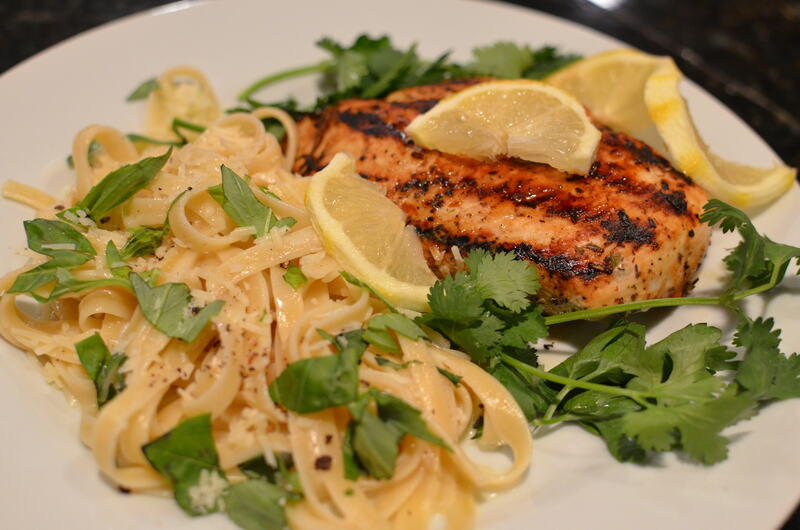 Use a peeler to remove strips of zest from half of the lemon. Reserve. Grate the other side of the lemon to make 1 Tbs zest. Then squeeze the juice from the lemon into a bowl. 2. Combine lemon zest and juice, oil, garlic, parsley, thyme, marjoram, salt and pepper in a large zip-top plastic bag. Add chicken breasts. Marinate in refrigerator for 30 minutes. 3. Prepare grill to medium-high heat. 4. Remove chicken from bag; discard marinade. 5. Place chicken on grill rack coated with cooking spray; grill about 10 minutes on each side or until done. Sprinkle with lemon strips and additional lemon to serve. 1. Place butter in a heatproof bowl. Beat until smooth with an electric mixer. Add cream and Parmesan. Set aside. 2. Cook pasta according to package directions. Drain and immediately add to butter mixture in the large bowl. Toss to coat well. Season with pepper. 3. 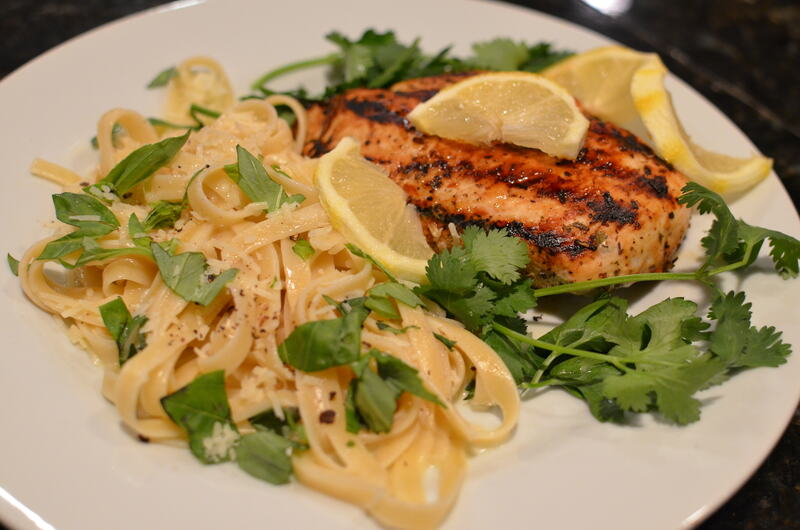 Serve pasta with sliced basil sprinkled over. I have been really loving this new song from Tu Fawning. Completely addictive right from the opening beats. The vocals are dreamy and wonderfully calming. Anchor is available as a free download on the band’s Soundcloud page. Check out Tu Fawning on the Website, where upcoming tour dates are listed. The new album is out in May on City Slang Records. You can also buy the music here. This entry was posted in Chicken, Main Courses, Pasta and tagged Tu Fawning. Bookmark the permalink. 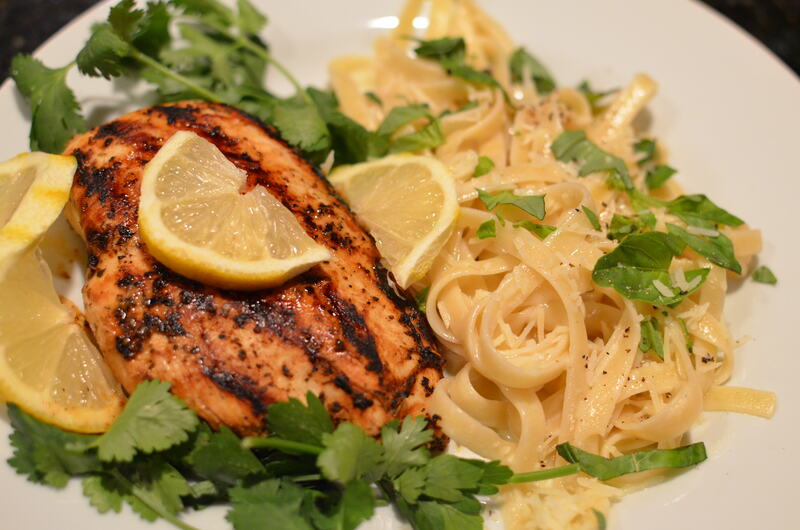 2 Responses to Lemon Grilled Chicken With Creamy Fettuccine Alfredo. Dreamy Music From Tu Fawning. I made this chicken for dinner tonight, didn’t feel like grilling since its snowing like crazy out, (gotta love Vermont winters) so I pan seared it. Sooooo good! I paired it with a three cheese spinach and artichoke pasta and we’re all in a food coma now. I can’t wait to try it with shrimp. :) great recipe. Yep, I know those Vermont winters! Your pasta recipe sounds yummy! And using shrimp…I need to do that, too.